I am honoured to have been invited to contribute a piece to Inyathelo’s 2016-2017 annual report under the theme of “Reimagining Our Future”. As a starting point, it is worth reminding ourselves of the steadfast and important role that advocacy organisations, like Inyathelo and the Graça Machel Trust, play in these tumultuous times. Advocacy is defined as “the act or process of supporting a cause”. In the case of the Graça Machel Trust, our cause is rooted in improving the lives of Africa’s women and children, to realise our vision of creating caring societies that value social justice, equal opportunity and sustainable development. This vision appears a long way off when faced with the signifi cant challenges in education, malnutrition, high poverty and unemployment levels, weak governance and leadership, to name a few. However we are encouraged by the sheer number of civil society and community-based organisations that are working across Africa to push back the tide of under-development. Herein lies our potential to bring a groundswell of real and sustained change for our youthful population whose futures cannot be squandered. The premise of the Graça Machel Trust is that together, we are stronger. We believe in the power of collective action; in connecting people and networks around a common agenda; in using coordinated advocacy efforts at local, regional and global levels to tackle the development challenges of the continent; and to find African-led solutions to ensure a more inclusive and prosperous future for coming generations. The shifts in focus areas and issues within the development landscape mean that if civil society organisations are to remain relevant and deliver on their goals, they will need to actively fi nd ways to work together, jointly build capacity and leverage each other’s reach to ensure greater impact. Now more than ever, there is a need for African civil society organisations (CSOs) to use smart collaborations to accelerate and magnify their impact, while taking steps towards greater self-reliance and self-sustainability. At the Trust, we see ourselves as a bridge linking the efforts of civil society organisations and communitybased organisations to resources and skills that improve their effectiveness as agents of change, while giving them greater recognition and visibility for their work. Through our multi-sectoral engagement, we are able to help networks and in-country partners to access those in authority at the highest levels of government and the private sector, to push for more coordinated and inclusive approaches to solving the challenges facing Africa’s women and children. Women are an important contributor to the African growth story, but in most countries women’s economic contributions are undervalued and not enough is being done to harness their economic potential and allow them to lead the lives they choose. Statistics show that 70% of women are financially excluded and operate outside the formal fi nancial system. Women are an important contributor to the African growth story, but in most countries women’s economic contributions are undervalued and not enough is being done to harness their economic potential and allow them to lead the lives they choose. According to the African Development Bank, the impact on society of not integrating women fully into national economies is extremely high. The result is that annual economic losses due to gender gaps in the labour force have been estimated at USD60 billion for the Africa region. A recent UNDP report has an even higher number, with estimates that the gender gap costs sub-Saharan Africa USD95 billion a year. If governments are serious about increasing tax bases and mobilising additional domestic resources to fund development needs and commitments, then more decisive action is needed to address the genderexclusionary policies and practices. So what is our advocacy approach in dealing with these complex and seemingly insurmountable challenges? Over the past five years the Trust has mobilised and established networks of businesswomen and professionals across the continent to connect, unite and grow a recognisable movement of women inspiring each other to influence the changes they want to see in their worlds. We have also worked with CSOs focused on children’s rights and nutrition to build their capacity through training and institutional support. We help to nurture and grow our women’s networks into apex business bodies that gather smaller organisations under their wings to create powerful national and regional alliances. Lastly, by strengthening their monitoring and accountability mechanisms, our in-country partners and networks are now able to reduce the gap between policies on paper and their effective implementation. Re-imagining our future thus means first believing that we can make signifi cant progress in our lifetimes. It means seeing measurable progress year on year, to inspire us to continue to do more. It also means setting and working towards big, audacious goals that can transform the lives of millions. We must also recognise that creating the conditions for a better life for all will be accelerated by embracing the power of technology, putting many more resources into research and data collection, and by championing innovation in every aspect of society to drive change. 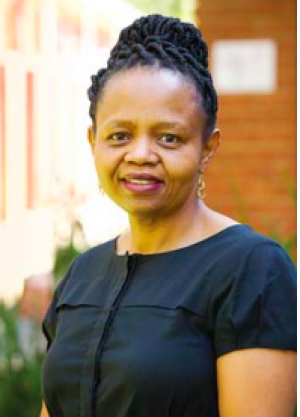 The role of advocacy organisations like the Graça Machel Trust and Inyathelo, in partnering with governments, business, academia and civil society, is essential to massively scale up programmes that are working. Also to create new initiatives where there are gaps, catalyse action at community, national and regional levels, and hold ourselves accountable to realising the goals we set for ourselves to improve the quality of life of Africans today and into the future. Originally published in the 2017 Innyathelo Annual Report.